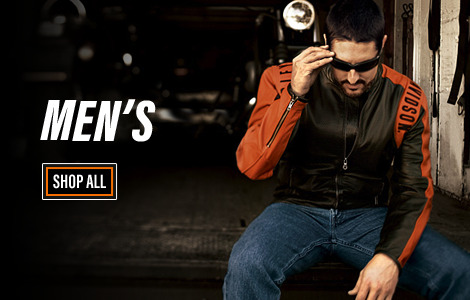 Be motorcycle ready and fashion-forward with our huge collection of "Essential" jackets, shirts & hoodies, boots, helmets, jewelry & watches, gloves, and eyewear - all styled with signature Harley-Davidson® logos. Whether riding or strolling around town, we have you covered with fashionable clothing for work or play, with caps, jewelry, watches, and more. Relax and enjoy browsing. If it’s "Essential," we’ve got it in the collection. Trust WisconsinHarley.com for your Essential needs. In this section we have organized motorcycling’s “Essentials,” for both men and women. Organized into eight categories, we have Leather Jackets and Vests, Footwear, Helmets, Gloves, Eyewear, Shirts & Hoodies, Headwear, and finally Jewelry & Watches. Harley-Davidson® designers know that our enthusiasts are well-balanced in life. They do more than just ride motorcycles. They live, work, and have fun with just about any activity – at the beach or lake, picnics in the park, hiking, or nights on the town. So, don’t be surprised when you see many fashion-forward designs that can also be worn off the bike. Whether it’s a dress-up for dinner party shirt or a laid-back long sleeve cardigan, there is an essential something that will add a bit of zest to your life, on and off the bike. Wearing a leather or textile jacket will keep you cool on hot days and warmer in cold weather. Having a properly fitted pair of boots will make all the difference on almost any ride or other activity. Helmets are a safety must when riding, and required by law in many states. So is protective eyewear. Losing an eye to road debris – well, it’s too terrible to contemplate. Gloves will cool or warm the hands during all riding seasons, and they reduce fatigue. Headwear like baseball caps keep you looking sharp any time you are outside walking around. Fashion accessories in the form of a watch, ring or earrings make a statement that you are all Harley®, all the time. These items are things we think you might consider as "essential" for your Harley® wardrobe. For the experienced or the novice, for safety and/or good looks, this is the place to start. Kickstart your day right here - whether that includes cruising down country lanes on a summer day, or line-dancing at your favorite hangout at night, you will find what you need at WisconsinHarley.com.